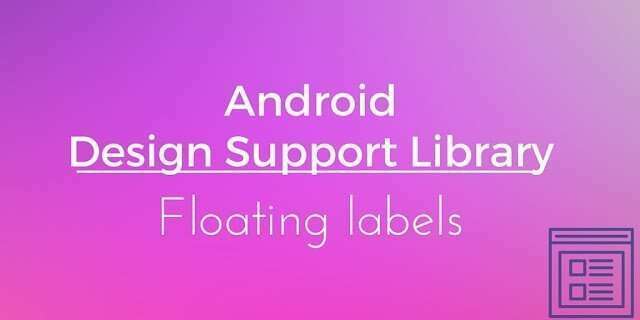 Android design support library introduced TextInputLayout – floating label and some other important new widget that helps developers to create consistent UI following material design guidelines. One of the new component shipped by Android design support library is TextInputLayout that is used to animate EditText labels. To do the job, TextInputLayout uses an EditText attribute, called hints. Another important feature is the error handling. With TextInputLayout it is possible to show error messages near to the EditText. As said before, TextInputLayout wraps the EditText so that it controls the EditText behaviour. Let us suppose we have three different EditText and three TextInputLayout. Focusing the attention to the first one of this EditText, this one has to be wrapped by TextInputLayout so that we can have the floating label. android:hint is the floating label that is managed the TextInputLayout. With this layout and a simple activity, it is possible to obtain the app shown above. Another interesting use of the TextInputLayout – floating label is in the form validation. As told before, this component handles error messages so that they appear near the EditText. This feature is very useful when the app has to validate some data inserted by an user. To show how to use TextInputLayout to handle EditText error we can suppose to have a simple form with a submit button as shown in the picture below. When an user pushes the button, the app validates the result and if something goes wrong, the app shows the error message near the EditText that caused it. 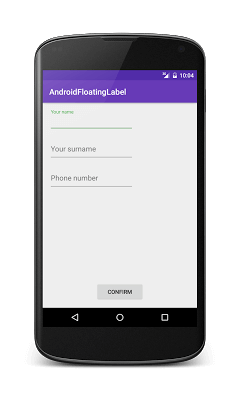 To handle the errors, TextInputLayout provides two methods: setError that accepts a string that contains the message and setErrorEnabled that accepts a boolean to enable or disable the error functionality. The first method is used to show an erorr message, the second to remove the message. 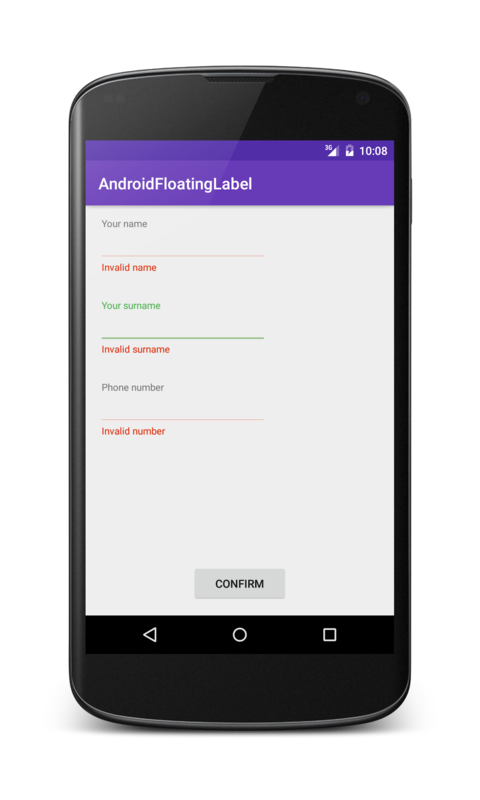 In this post, you have learnt how to create an Android app interface using material design and Android design support library: you saw how TextInputLayout animates EditText and handles error using the combination of TextInputLayout and EditText.